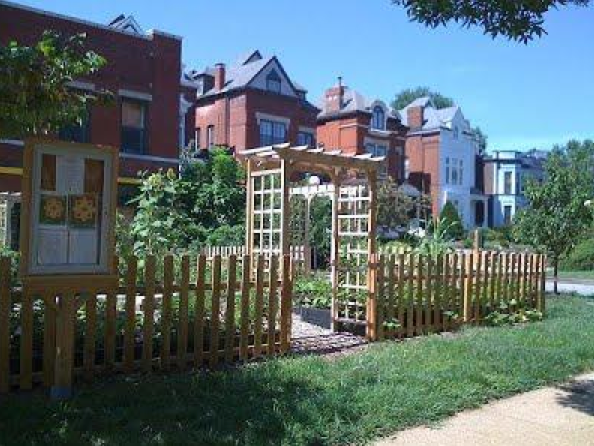 In 2010 a group of neighbors began our community garden with organizational support from Gateway Greening and with financial support from Park Central Development, from the West Pine-Laclede Neighborhood Association, and from the Manhattan Townhouse Association. Over the ensuing years, the Boyle-Laclede Garden has grown and improved with input from local gardeners, residents, neighborhood associations, and local craftsmen. Among the additions are a communal herb garden, fruit trees, grape vines, a compost bin, as well as a pergola and picnic table – the sum of which is an incredible asset to the neighborhood, aesthetically and socially. I became involved four years ago and learned that a garden is so much more than just a place to raise vegetables. It is a place to connect with other gardeners, with neighbors who share our passion, and with passers-by. People love to check out our garden and start conversations with the people who tend it. What a great way to get to know your neighbors! One day a woman came and sat on our bench facing the roses and the vegetable beds. She told me that this was her place of peace and she would come whenever she could while her husband was being treated at Siteman Cancer Center. Another day a group of boy scouts stopped to help turn the compost bin. We are far from experts or master gardeners. We are just people who love the concept of growing our own food while building community and improving our neighborhoods. As gardeners we share our frustrations and successes with each other and we learn together about best practices in organic gardening. We learn from our challenges and, hopefully, get a little better each year.